How Selling Your House to W Properties Works.. If you are like most people we work with, you haven’t sold a house in a while…have never sold a house to an investment company….OR just have lots of questions on how to sell your house as is. Don’t worry! We are here to answer ANY questions you have and want to make sure you are comfortable with and understand the process of selling your house to W Properties. 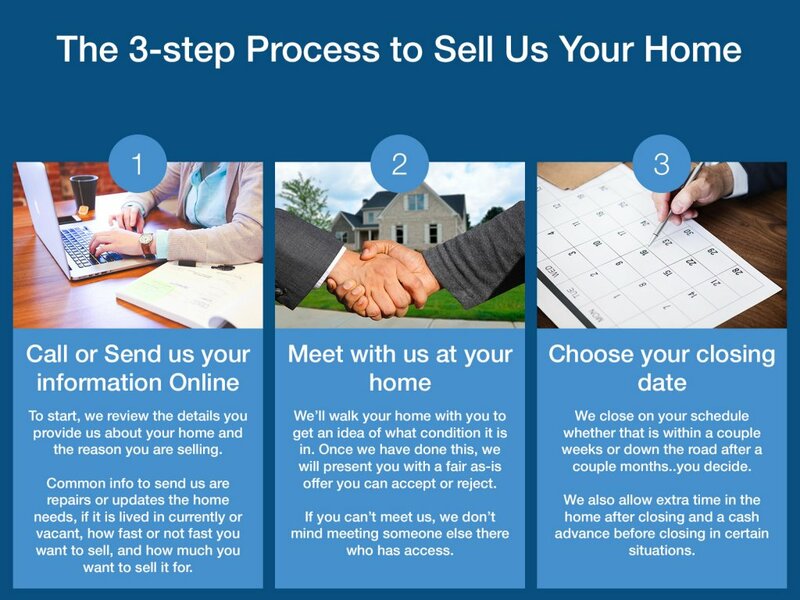 Below is a quick brief of our easy, 3-step process to sell us your home and below that are some questions we almost always get asked by folks. Where does the closing take place? – Closing takes place at a local title company (Old Republic Title). They prepare all the closing documents for both of us and make sure that the title is clean and clear as well as that our money is good and ready to go. Do I need to be in Oklahoma City for the closing? – Nope! Either the title company will e-mail you documents to electronically sign or we’ll pay for a mobile notary to meet you somewhere local to sign. The title company will then either mail you a check OR wire the money directly into your bank account. Do I have to repair or clean anything? – Not at all. We prefer to buy homes as-is so you don’t have to clean anything or repair anything. You can even leave unwanted belongings behind! Who pays the closing costs? – We pay 100% of the closing costs. Typically this would cost you $700 – $1200 as the seller. What if I haven’t paid all my property taxes? – That’s ok. We pay all the property taxes also, even delinquent property taxes. Will you buy a house that is rented? – Yes, we will. Ideally, the house would be empty, but if it comes already rented, we’ll still buy it. Can I get some money up front before closing to help with moving? – We do advance money for people that need some cash before closing to help with moving or just pay some debts. This is done once the title company tells us the title is clean and the amount is negotiable between us. Will I have to be out of my home on the day of closing? – No, if you need extra time in your home AFTER closing, we can arrange that. We’ll go ahead and buy your house, then rent it back to you at a very low rate (to cover our monthly costs like mortgage, taxes, insurance) for up to 30 days. What if I owe more than you can offer? – If you owe more than the house is worth, we can work with your bank to buy the house at a fair price less than what you owe and in exchange the bank will clear your mortgage in full. This is called a short sale and we’ve helped a lot of folks through this. How fast can you close? – As quick as 2 weeks but longer if needed. Can you buy a house in probate? – We buy a lot of houses in probate every year. We know a lot of probate attorneys around town and are familiar with the process of buying a home in probate. If you have a house that hasn’t gone through probate yet, we can even buy that and pay for the attorney costs. What if I don’t accept your offer? – Well, we will be sad but you aren’t obligated to accept any offer we make. Feel free to say no, or YES, or even counter-offer. What if I want to fix my property up and sell it instead of selling it as-is? – If you don’t want to sell your house as-is for a price that makes sense to us, we can let you use our contractors to remodel your home so you can then sell it for more. You’d have to pay for the remodel of course but you would then be able to sell your home for more. Do you buy multiple properties at once or just one? Yes, we can buy multiple properties at once. This often comes up when landlords want to get out of the business and sell off their rental properties. We see some folks want to sell us 2 homes, 10 homes, and the most we’ve had brought to us at once so far was 44. If you don’t buy my house, can you help me sell it? Absolutely! Sometimes we just can’t agree on a price or run into houses we just aren’t interested in buying. If that is the case, we will gladly help you sell your home on the open market.